The QUEST 2012 Planning Committee is seeking five active CQAA members to serve as Track Hosts during the QUEST 2012 Conference the week of April 30 – May 4. The Track Host works with the Lead Track Host and the QAI Global Institute’s staff to help make QUEST 2012 a positive learning and comfortable experience for all presenters and attendees. This is achieved through assisting with daily operational logistics in each of the classrooms and breakout sessions, as well as providing assistance at networking events and at the registration desk as needed. The Lead Track Host is the primary point of contact before, during, and after the conference and provides all conference program updates, changes, and answers any logistical questions. 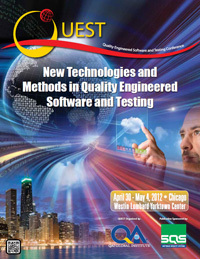 Track Hosts receive a five-day complimentary registration to the QUEST conference and will be attending the sessions in their respective tracks. Available for Track Host planning meetings as requested by the Track Host Lead. Available for all five days of the Conference. Available and willing to volunteer to help with registration least one conference day if needed during the conference. Download a Track Host Application here. Send your completed application to Ryan Wiersema, Lead Track Host, at rwier84@gmail.com no later than March 16, 2012.